The off-season is just around the corner, and most athletes take a very relaxed approach once the off-season starts. One can understand this, as most athletes need the mental break as much as the physical, in order to recharge the motivation for the following season. But not having a plan for the off-season is as bad as not having a plan for the competitive season. Once the competitive season starts, there is little time to address weaknesses and technical inefficiencies or tweaks that are needed. For most athletes, this off-season period is critical for breaking through to the next level, and without a clear plan or clear training goals to address the things holding them back, improvement is not likely. How can an athlete leverage the off-season to strengthen weaknesses? First, an athlete has to be honest and clear about what their weaknesses are. Perhaps an athlete has a run cadence that is just too slow, and needs to be addressed in training. Or perhaps the athlete has very low peak power values for 5 to 30 seconds. 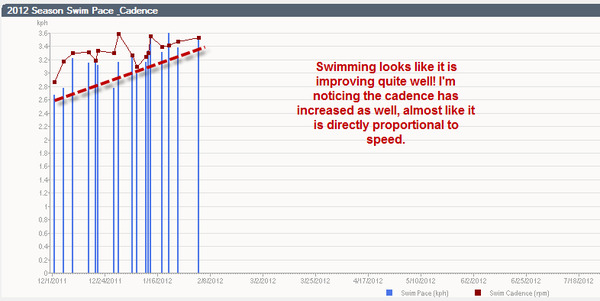 Or maybe the athlete wonders if a focused increase of cadence in the water will lead to more speed? Once an athlete has identified the weakness or limiter, elements should be incorporated into their workouts to improve upon that limiter (the specifics of which are another subject matter altogether). Then, a training metric should be designated to track whether the training prescribed is actually addressing and improving the weakness. After all, changing the training is easy, but making sure it is effective is the hardest and most important part. If improvement can be shown and tracked, it will help with motivation, confidence and assessment of the training plan. The following is an example of Peak Power values for 5 to 30 seconds, throughout the off-season. In this chart, the athlete can see a big improvement in those values. Here’s an example of a chart thru the off-season of an athlete I worked with, where we tried to experiment with higher swim cadence, and see how this affected swim paces in training, hoping to improve the athlete’s swim thru the off-season. 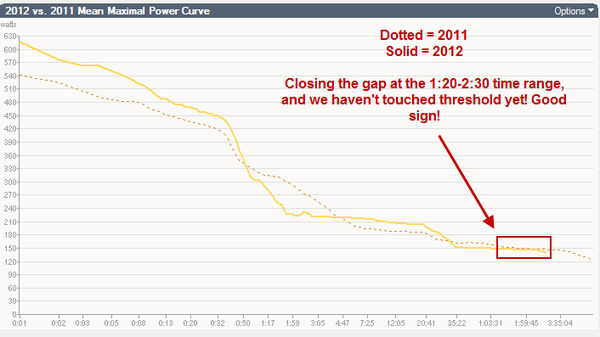 Below is an example of how I compared and tracked an athlete’s power outputs from the entire 2011 season (On TrainingPeaks this can be shown with a Peak Power chart), with the early 2012 season, (December and January in this case), where we focused on shorter outputs, (5-30 seconds), and basic aerobic, Zone 2 power. You can see the athlete’s shorter peak power values were higher than all of 2011, but the better result we saw was improvement of Zone 2 power at longer time ranges. The results helped me assess how the training was going. This athlete went on to have a much-improved season on the bike. Consider a weakness you have that needs to be addressed during the off-season, and what metric(s) you can track using TrainingPeaks software to see if it is improving, and judge your training decisions. If you follow the data, your training, confidence, motivation and performance will all likely improve! Don’t under-estimate the importance of the off-season. Best of luck!